This year’s Adult Spelling Bee will be held in the new Cove Commons – the combined Library Annex and Arts Council Gallery. Audience tickets are $15 and available online here bit.ly/3rdAdultSpellingBee or at the library. This year’s proceeds will go toward new furnishings for the Library Annex. The Annex and Flex Room are wonderful places to gather, study, read or attend a program and are providing the library with many more options for services and programs. Once furnished with multi purpose, flexible lounge seating and study tables the Annex will be even more welcoming and comfortable for all visitors to the library. The 2nd Annual Adult Spelling Bee – Another Fine Time! Another fabulous night of spelling was had by allow September 30, 2017! 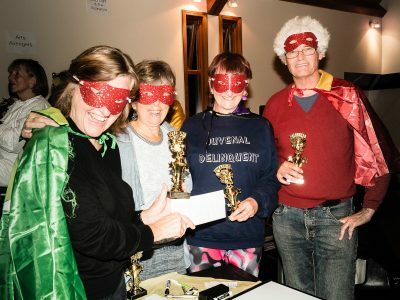 Congratulations to our winners, the Arts Avengers (pictured below), to the Best Team Theme winners, the Spell Checkers, and to winners of the Biggest Honey Pot Prize, The Bee Catchers, for raising the most funds! This second annual event was another fundraiser for our Cove Commons Project, which needs funding to complete the public plaza outside. Together we raised over $1200.00 for the plaza, thanks to all of you who came out, participated, and sponsored your favourite teams! …and Thank You to our wonderful volunteers, who made this event possible! They are: Ted Benson, Kate Coffey, Ralitza Dimova, Filis Fahey, Judi Gedye, Susan Geist, Len Gilday, Audrey Grescoe, Sarah Haxby, Devon McLeod, Melanie McLeod, Cynthia Nicolson, Rory O’Connell, Leo Pedersen, Michael Penny, Andrea Rayment, Susan Sheehan, and Greta Smith. Our first Annual Adult Spelling Bee was a buzzing success! On Saturday October 22, 2016 ten teams of 4 spellers vied for the Golden Bee Award. Competition was fierce (in between the laughing) and the winning team came in just five points ahead of the others. 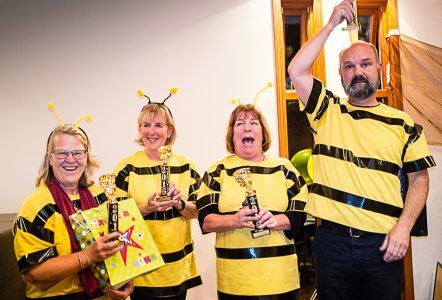 Congratulations to the Killer Bees, featuring Michael Epp, Colleen Ireland, Lynne Roedde and Suzan Ross who took the trophies with 255 points. Second place went to the Spellcasters, and third place was tied between the Arts Avengers and the Buzzer Killers. 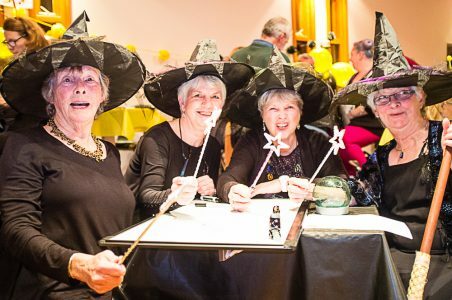 Best Team Theme went to team Spellbound, and the Bee Witched team won “Most Spirited Team”. This year’s Bee was a fundraising event for the Cove Commons project (Annex/Gallery), and we thank all participants and sponsors for their help in raising over $1,000 for the project. If you wish to donate to the Cove Commons you can still do so with a credit card online here. Thank you to the 40 team members who were so very brave to step up and be “spellers”. 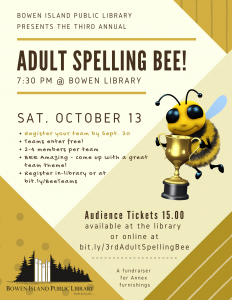 We will continue this new tradition next October with the 2nd Annual Adult Spelling Bee. Team Spellbound won the “Best Team Theme” prize. For those audience members who wanted to play along – next year we’ll have note cards and pencils for you to test your skills against the teams. A link to this year’s word list is below in pdf.